A 38-year-old postpartum female presented with fatigue, shortness of breath, and dyspnea on exertion, 3 months following an uneventful spontaneous vaginal delivery. Prior medical and family histories were unremarkable. The patient had normal blood pressure, electrocardiogram, cardiac enzymes, C-reactive protein, lipid profile, and viral titers. Echocardiography demonstrated moderately depressed global left-ventricular function. 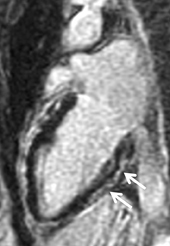 Cardiac magnetic resonance imaging (MRI) was subsequently performed. Short-axis CINE steady-state free-precession (SSFP)imaging, acquired following perfusion imaging, confirmed moderately depressed left-ventricular function, with an ejection fraction of40%. As shown with select short-axis diastolic (Figure 1) and systolic (Figure 1) images, the shortening fraction was 15%. Short-axis T1 dark-blood imaging (Figure 2) through the basilar left ventricle (LV) revealed mildly heterogeneous myocardial signal intensity. Corresponding short-axis T1-weighted inversion recovery (IR) imaging (Figure 2) acquired 10 min after perfusion imaging demonstrated abnormal subepicardial delayed hyperenhancement (DHE) involving the anterior-lateral, inferior-lateral, inferior, and septal myocardium. Two-, 3-, and 4-chamber (Figure 3) delayed IR sequences confirmed regions of abnormal myocardial DHE involving the subepicardial mid and basilar inferior wall (A), anterior septum (B, long arrows), basilar inferior-lateral wall (B, short arrow), mid and basilar inferior septum (C, long arrows), and basilar anterior-lateral wall (C, short arrow). 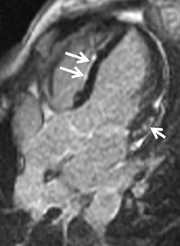 In retrospective analysis, note early myocardial retained Gadolinium in the short axis CINE SSFP acquisition (Figure 1), corresponding to regions of abnormal DHE. To view these figures in our DICOM viewer, click here. 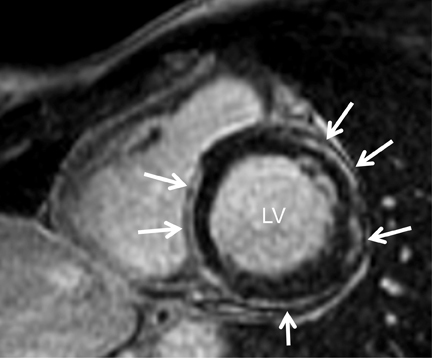 Postpartum cardiomyopathy (PPCM) is a rare idiopathic cardiomyopathy resulting in left-ventricular (LV) dysfunction and heart failure, presenting in late pregnancy or in the first few months following delivery. LV ejection fraction is typically reduced to below 45%. In the United States, the incidence ranges between 1 in 2500 to 4000. The majority of patients (approximately 75%) present within the first 4 postpartum months. PPCM is postulated to arise from oxidative stress and elevated levels of the prolactin-cleaving protease cathepsin D in cardiomyocytes, in the setting of elevated prolactin (eg, nursing), resulting in a subprolactin fragment. This fragment promotes vasoconstriction and induces endothelial apoptosis, leading to impaired cardiomyocyte function. Contributing causes may include an inflammatory process, an abnormal autoimmune process, viral infections, cardiovascular disease risk factors (eg, hypertension, diabetes, tobacco use), and pregnancy risk factors (eg, age, number of pregnancies). 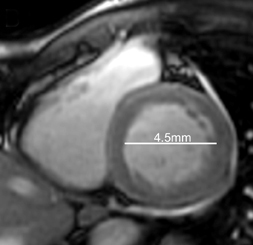 As with the patient in this case description, clinical presentation is one of heart failure. Symptoms may include shortness of breath, persistent cough, dyspnea on exertion, orthopnea, paroxysmal nocturnal dyspnea, chest pain, palpitations, dizziness, and abdominal discomfort(eg, hepatic congestion). Physical examination may reveal peripheral edema, elevated jugular venous pressure, rales, tachycardia, s3 or s4gallop, a mitral regurgitant murmur, or a pericardial friction rub. The standard initial evaluation of clinically suspected PPCM includes chest radiography, electrocardiography (ECG), laboratory analysis, and echocardiography. Detailed diagnostic evaluation is essential to assess for alternative cardiac (eg, hypertensive cardiomyopathy,valvular heart disease) and noncardiac (eg, pulmonary embolism) etiologies, as PPCM is a diagnosis of exclusion. 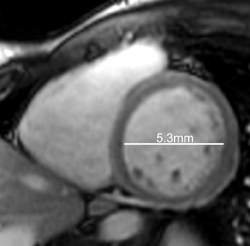 Cardiac MRI with a perfusion and viability protocol is an invaluable tool to characterize the myocardium, to quantify cardiac chamber volumes and ventricular function, and thereby, to more definitively diagnosis PPCM. 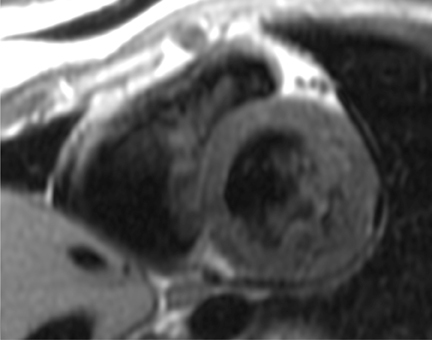 Key MRI findings for PPCM include global depressed function and a nonvascular territory pattern of DHE (as seen with other inflammatory cardiomyopathies). DHE will be found in the subepicardial myocardium, corresponding to regions of myocardium infiltrated with cellular lymphocytes and containing a variable extent of myocyte edema, necrosis, fibrosis, or a combination thereof, depending upon the time course of disease. Sliwa K, Hilfiker-Kleiner D, Petrie MC, et al. Current state of knowledge on etiology, diagnosis, management, and therapy of peripartum cardiomyopathy: A position statement from the Heart Failure Association of the European Society of Cardiology Working Group on peripartum Cardiomyopathy European Journal of Heart Failure. Eur J Heart Fail. 2010;12:767–778. Kawano H, Tsuneto A, Koide Y, et al. 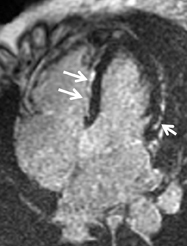 Magnetic resonance imaging in a patient with peripartum cardiomyopathy. Intern Med. 2008;47:97-102.